These earrings are original acrylic miniature paintings on wood with a clear polyurethane finish. The paintings are of a Native American Symbol from the Mississippian Period of the mound builders Indians. 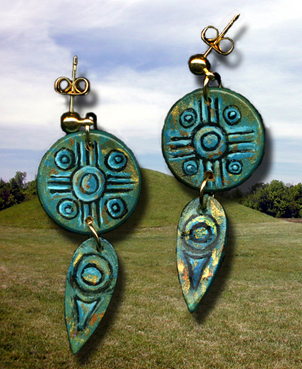 This symbol originated on a large copper ear-spools earring. The earrings have gold plated ball post and ear nuts for pierced ears. The back of each earring has been painted, signed and dated by the artist. The total length of the earring is only 2 inches.